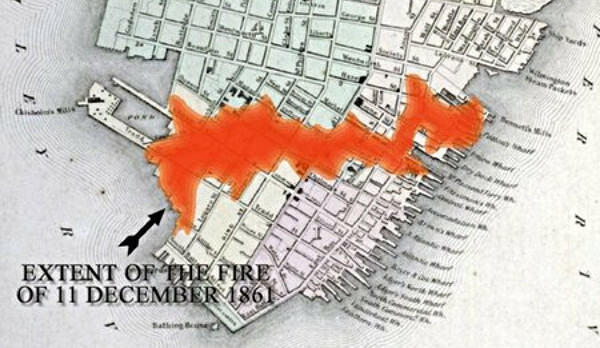 Map showing the extent of the December 11, 1861 fire. Courtesy of lowcountrywalkingtours.com. Charleston has suffered through many natural and manmade disasters over the last 300+ years, but the most prolific source of havoc was that blood-thirsty tiger: FIRE. Sized from small to large and far too many to count, Charleston's fires have reconfigured the city's built landscape and shaped its future numerous times, especially those known as the great fires: the waterfront fires of 1740 and 1778 as well as the decade of fires in the 1830s-- including the devastating Ansonborough fire in 1838. 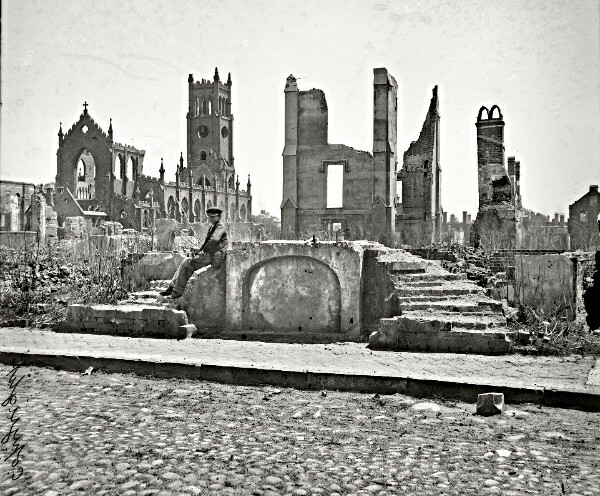 But the mack-daddy of all Charleston fires was the one that left a huge part of the city in ruins for decades--throughout the Civil War and for many years after, it was known as The Burnt District. According to most accounts, the fire started sometime before 10 p.m. on December 11, 1861 at the William P. Russell & Company's Sash and Blind factory at the foot of Hassell Street, on or near the site of the present day Harris Teeter. The source of the blaze is speculated to have been a fire built for warmth or cooking by some slave refugees sheltering beside the factory. The last several days had been mild, but a cold front was coming in from the northeast blowing gale-force winds that spread the fire easily and quickly across the peninsula in a southwesterly direction; it would burn out of control until there was nothing more in its path to destroy. A diary from the time called it a Hurricane of Fire, and indeed it was. Left: Secession Hall, 1960, flanked by the Circular Congregational Church and by Nicholas Fehenbach's Teetotal Restaurant (Justin A. Shaw via civilwar.org). Right: Bird's Eye View of Meeting Street looking north from atop the Mill's House Hotel, 1865. Photo by George N. Barnard. Library of Congress. Witnesses were amazed by the speed and intensity of the fire. By midnight, the Circular Church on Meeting Street was burning, and next door the South Carolina Institute Hall was aflame. Less than a year before, 170 delegates had walked upon the stage of the Institute Hall, signed the Ordinance of Secession for South Carolina, and the first state had officially seceded from the Union. Subsequently, Institute Hall was commonly referred to Secession Hall, and some would find it ironic that the two buildings most significant to secession--Secession Hall and St. Andrew's Hall on Broad Street were both destroyed by a fire accidentally set by slave refugees. But that wasn't all that was lost: 540 acres had been burned, including more than 575 buildings, leaving hundreds of souls without shelter. But, as they say, it could have been much worse. At least some buildings were saved. The Mills House Hotel was spared by the fire. Photo by George N. Barnard, 1865. Library of Congress. In November, 1861, Port Royal in Beaufort county had fallen to Federal troops, providing them with a deep-water port from which to attack the entire Confederate coast. General Robert E. Lee travelled to Charleston to assist General Roswell Ripley in strengthening the city against an inevitable attack. According to Daniel J. Crooks, Jr's Charleston is Burning! : Two Centuries of Fire and Flames, Lee was crossing the Ashley River to the western part of the peninsula when he saw the flames on the eastern side of the city. Unaware of the magnitude of the conflagration, he went to his rooms at the Mills House and entertained guests at dinner. After realizing that they were in the line of fire, Lee and his party were evacuated to the empty town home of the Alston family on the High Battery at 21 East Bay Street. General Ripley stayed behind to oversee the firefighting efforts, which were greatly hampered by the lack of water to draw from as it was low tide. Under his direction, over a dozen houses on Queen Street were demolished with dynamite in order to prevent the fire from advancing to the Roman Catholic Orphan Home at Queen and Logan as well as the block beyond which contained the hospitals, the Medical College, workhouse, and jail. The strategy worked, and according to the Charleston Times, "The Mills House was only saved through almost superhuman exertions and its blacked walls attest the severe trial it had undergone." Evidently, the hotel staff was able to extinguish flying cinders that landed on the building by hanging out its windows and swatting with wet blankets. Talk about going beyond and above! Ruins on Queen Street with the Cathedral of Saint John and Saint Finbar in the background on Broad Street. Photo by George N. Barnard, 1865. Library of Congress. According to the Charleston Times, "The loss of property has been variously estimated at from five to seven million dollars. Five churches, namely: The Circular, the Cumberland Methodist Church, St. Peter's Church in Logan Street, St. John's and St. Finbar's Cathedral...and the Quaker Meeting House in King Street...St. Andrew's Hall, Institute Hall, the two Savings Institutions, the Theatre and large Southern Express buildings are all gone." The Mercury kept a log of the losses and devoted a column in the paper to offer architectural obituaries of some of the grand colonial homes that were lost in the fire, including the ca 1750 Pinckney mansion on East Bay Street, also known as the Governor's Palace. The Charleston Courier carried an obituary for the Cathedral on Broad Street that had only been completed eight years prior, crowned with a gold cross that rose almost 300 feet in the air. "All of a sudden it was announced that beautiful architectural structure, St. John's and St. Finbar's Cathedral, was in flames. The pride of that portion of our city was doomed to destruction, and its beautiful spire soon fell with a terrific crash, sounding high above the noise of the devouring flames." Unfortunately, many believed the structure to be fireproof and had moved their possessions inside for protection. Doubly-cursed, the Cathedral's insurance policy had expired a week prior; but in the end the fire bankrupted all but one insurance company, anyway. In many ways, the Great Fire of 1861 became associated with the Civil War. Some people at the time of the fire--both here and elsewhere--postulated that the fire was indeed 'part of the war' as they assumed it was set by Northern sympathizers, although there is no evidence of that whatsoever. 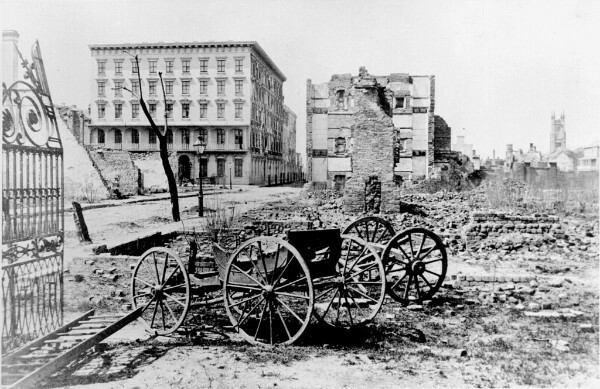 Many people who see the post-war photographs of George N. Barnard and others assume that the destruction portrayed in the Burnt District is due primarily to Union bombardment of the city (1863-1865), which it most certainly was not. In fact, the fire probably saved the lives of many Charlestonians who may have otherwise been in their homes during bombardment; instead the shells fell onto what was already in ruin. Because of the War, the area was not rebuilt for many years, several decades in some cases: it took thirty years to begin building a new Circular Church on Meeting Street and a new Cathedral on Broad Street. That's a long time for a proud city to look such a mess, but look at us now! 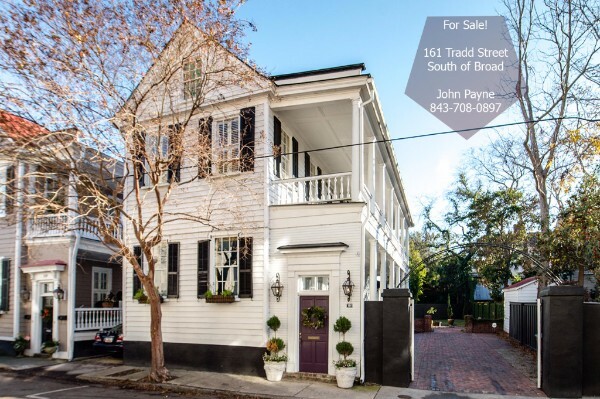 161 Tradd Street was built ca 1870 and is currently offered for sale by John Payne. 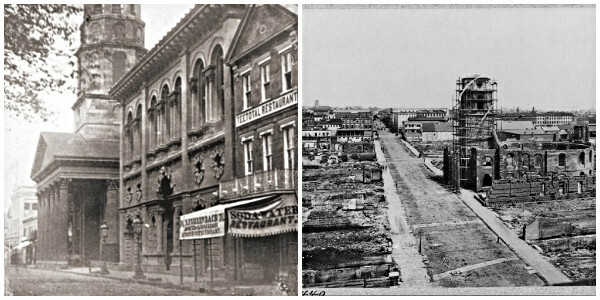 The Mercury reported, "Horlbeck's Alley (from Meeting) to King Street is in ruins," "Church Street, from the corner of Market to Cumberland, is also burned." Meeting Street, Queen Street, Logan, Broad. And then, "The residences on Tradd Street, from Logan to Savage, on either side, with Greenhill, Limehouse and Council streets are, with one or two exceptions, all in ruins." Lois Lane Properties currently has two homes in this stretch of Tradd Street listed for sale. 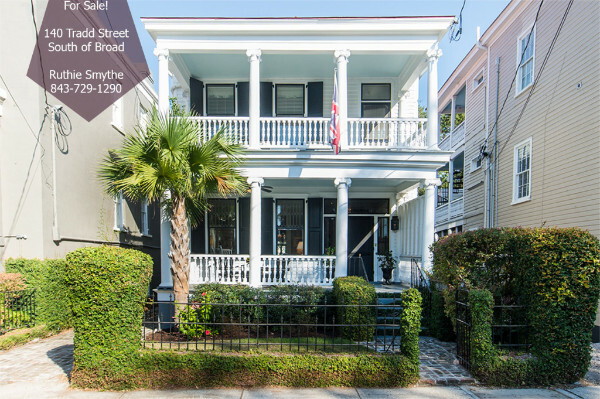 John Payne just listed 161 Tradd Street, a Charleston single on the south side between Council and Limehouse streets. This area was re-built fairly quickly after the fire; this dwelling was built around 1870. Please call John at 843.708.0897 to find out more about this fantastic home! A block further up Tradd, across from the top of Greenhill Street is 140 Tradd, listed for sale by Ruthie Smythe. A leading building and contractor at the time, John Kenny, lived at 142 Tradd Street, a three-story masonry building that likely survived the fire. He built the three-story wood dwelling at 138 Tradd before 1870, leaving the lot at 140 empty and divided between the two properties. He also constructed the three side-hall-plan dwellings at 132-136 Tradd from 1882-1885. The lots were divided and sold after 1902 and the current dwelling at 140 Tradd was built in 1904. This is a must-see! Please call Ruthie at 843.729.1290 to schedule a showing. 140 Tradd Street was built in 1904 and is currently offered for sale by Ruthie Smythe.